How Did the Moon’s Surface Form? Perhaps we don’t realize when we look into the night sky at the moon that we are observing some of the most ancient surfaces known within our solar system. The formation of the moon is linked to the early stages of Earth’s evolution, and therefore understanding the evolution of the moon is of interest to Earth scientists as well. Moon rocks preserve the lunar history in their minerals and textures. As it turns out, researchers don’t need a large sample to gain interesting insights. 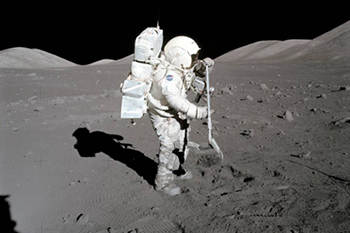 A small scoop of lunar surface material (i.e., regolith) collected from the Apollo 17 mission is bringing researchers one step closer to understanding how the lunar surface formed. Das and Earth sciences Professor Suzanne Baldwin, along with Professor John Delano, their collaborator from University at Albany, were able to extract information from tiny samples of lunar regolith. These samples were collected 44 years ago on the surface of the moon by Apollo 17 astronauts. The project is part of an investigation carried out in collaboration with the New York Center for Astrobiology. The team examined 11 fragments, which, when combined, weigh less than a grain of rice. The scientists were able to determine the age of the fragments, as well as how long the grains had been on the surface of the moon and their source on the surface of the moon. The samples came from the base of the Sculptured Hills, located north of the Taurus-Littrow valley where Apollo 17 landed in 1972. During their last traverse on the surface of the moon, Apollo 17 astronauts dug a 25 cm-deep trench at the bottom of the Sculptured Hills. For their study, Das and his colleagues acquired material from the top 6 centimeters of the trench. The team established the age of the tiny rock fragments by using the 40Ar/39Ar radiometric method. By measuring 40Ar/39Ar ratios using a highly sensitive noble gas mass spectrometer, the team determined minimum ages of crystallization for the small rock fragments. The samples were found to be 4.1-4.4 billion years old. The 40Ar/39Ar ages are the first ages determined for the regolith sample that was collected at the base of the Sculptured Hills. Surprisingly, although the individual fragments came from the same 6 centimeter-deep scoop, they spent different durations on the surface of the moon. The duration spent on the lunar surface was determined by using 38Ar, an isotope of argon that is produced when minerals are exposed to highly energetic cosmic rays (mostly protons) from the sun and other stars. 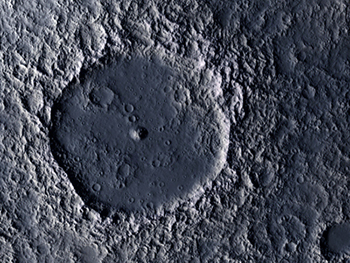 Using the rate of 38Ar production, Das and colleagues determined that neighboring particles had been at, or near, the lunar surface between 1 and 24 million years. Das suggests a few explanations behind the range in time estimates for the rock fragment’s surface exposure. The first explanation comes from an active process known as reworking of material on the surface. Das explains: “The fragments are so fine that under the electromagnetic field of the sun, they actually jump around on the surface and you can measure the difference in the duration the fragments spent on the moon’s surface.” The other possibility is that some of the fragments may have rolled down slope from the Sculptured Hills, resulting in a different amount of time exposed on the surface. By combining the results of 40Ar/39Ar ages and chemical compositions of the 11 fragments, Das and his colleagues were also able to determine that the fragments were derived from the highland rocks and not from the impact basins. “We wanted to use the noble gas (argon) to determine not only how old the rock fragments were, but also how long they had been lying on the surface of the moon,” Baldwin says. This study serves as a confirmation that valuable information can be gathered from < 1 mg samples. “We wanted to design our experiments to retrieve as much information as we could,” Das says. Das also hopes that these protocols will be useful in future space missions, with a specific nod to NASA’s upcoming OSIRIS-REx mission, the mission slated to gather samples from Bennu, a near-Earth asteroid 101955. “When you’re doing fieldwork on Earth, most of the time you can collect plenty of samples for analysis—that’s not the case on planetary missions,” Das says. Fortunately the protocol used by Das and his colleagues shows that even the smallest rock fragment can yield great insights about lunar processes. The funding for this study was provided by the NASA Astrobiology Institute (grant NNA09DA80A) and Syracuse University. 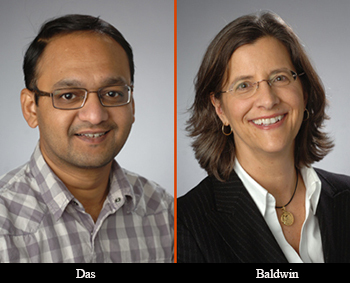 Das, Baldwin and Delano’s paper can be read in its entirety here.